OUTSTANDING +9,900 NBA RUN L5 MOS. MORE NHL WINNERS COMING TODAY! WINNING BASEBALL SEASON IN 2018! 3 OF 4 $$$ FB YEARS! SELECTIVITY + SPECIALIZATION = SUCCESS, SPS STYLE! 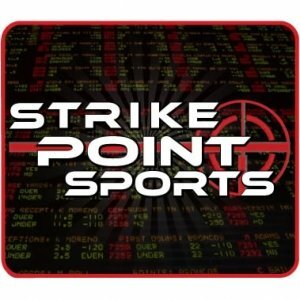 Strike Point Sports is one of the most versatile and successful handicapping groups in the country and a key facet of Doc's Sports Services. Modeled after the flagship service, Strike Point Sports is sort of a "Doc's Lite". SPS believes strongly in specialization, so we employ a team of handicappers that each excel at their specific sports. This committee approach has helped us become one of the most successful handicapping syndicates in the country. SPS handicaps all major sports including the NFL, NCAA Football, NCAA Basketball, NBA, MLB, NHL, WNBA and World Soccer. Another core tenant of the Strike Point Sports model is selectivity. By honing our focus on a limited number of selections in each sport we truly only put our money down on the best of the best situations every day. This approach has helped us hit incredible percentages and put together amazing runs throughout our tenure. Strike Point Sports is coming off its best year yet. OUR CLIENTS IN FOOTBALL, NBA AND COLLEGE BASKETBALL TRIPLED THEIR BANKROLL FROM AUG. 1, 2014 TO APRIL 8, 2015. Over that nine-month stretch we helped earn our $100-per-Unit bettors an amazing $32,200 in profit! Those documented numbers are astronomical and by far the best in the country. Specialization + Selectivity + Research + Experience = Handicapping Success! Put this all together and you have Strike Point Sports, a strong asset to the Doc's Sports team of handicappers.